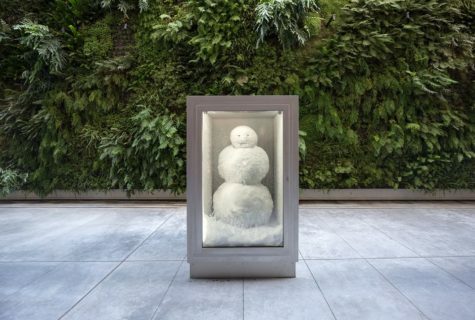 After a whirlwind tour of the Art Institute of Chicago and the San Francisco Museum of Modern Art, Peter Fischli and David Weiss’ Snowman (2016) has now taken up a long-term residency at the Museum of Modern Art in New York, as part of the outdoor exhibition If Everything Is Sculpture Why Make Sculpture? Artist’s Choice: Peter Fischli. Kept cool inside a glass doored freezer installed in the museum’s sculpture garden, the frosty figure visitors see today is actually the younger brother of a site-specific 1987 commission for a power plant in Saarbrücken, Germany, which provided the continuous flow of energy needed to create the work.